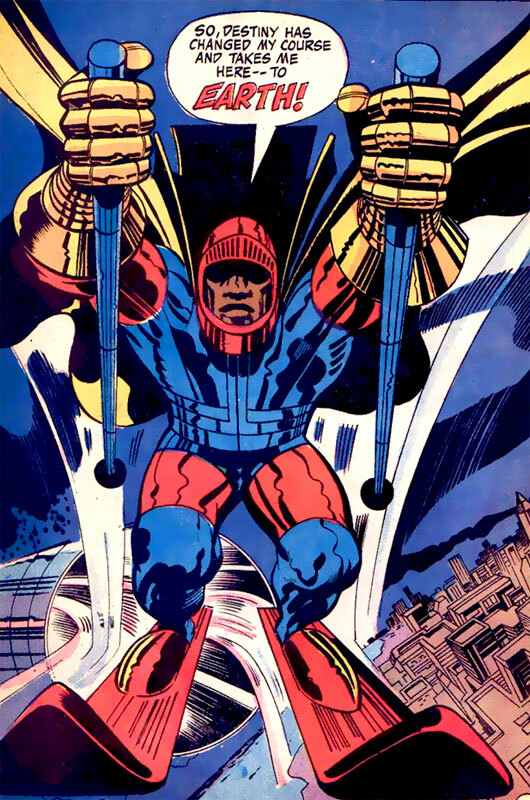 Powers: Flight through space by cosmically charged skis, he can also phase through solid objects, has virtual immortality, can deliver death with but a touch, armor aids him in withstanding the rigors of space and staff hands out justice. His death touch allows him to even kill gods. The Grim Reaper of the DC Universe. When it is your time to pass, the implacable Black Racer will be there in the end to guide your soul. The black racers touch is able to kill even gods. The power of the black racer lives inside Willie walker who was paralyzed in the Vietnam war. He was empowered after Darkseid brought the war to earth. He dies himself during the “Death of the new Gods” story-line and was reborn after the death of Orion. He eventually took a dyeing Darkseid to the new gods version of Hades. So when Kirby first designed the character, his outfit was red, blue, and gold…. interesting.